ComSpOC expands capabilities through additional radar sensor site at the Algonquin Radio Observatory. The Algonquin Radio Observatory's 46-meter radio astronomy antenna. 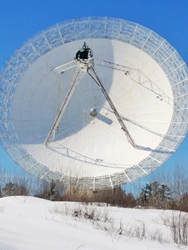 ComSpOC signed a data provider agreement last week with Thoth Technology, operators of the Algonquin Radio Observatory (ARO), to formalize efforts to advance the state of radar tracking of Geostationary (GEO) satellites and debris. This endeavor will upgrade a 46-meter radio astronomy antenna to include radar for surveying debris at geostationary altitude, and expand the space catalog to include objects that until now, have not been tracked. This site is a welcome addition to ComSpOC’s growing ground-based sensor network of over 50 optical sensors, long and short baseline RF interferometric sensor networks on two continents, and two phased array radars. ComSpOC integrates this data to develop high fidelity space situational awareness (SSA) products that track and characterize resident space objects with the results distributed via its Spacebook subscription. Space debris is a growing threat and through this agreement, ComSpOC and Thoth aim to map the most complete picture of the GEO belt to help ensure safe operations. Thoth Technology Inc. is a Canadian space and defense company that operates the ARO to provide a range of space tracking and communications services. The company also specializes in thermal vacuum and vibration testing to certify equipment for spaceflight and is an award-winning OEM supplier of miniaturized space payloads. In 2014, AGI established a Commercial Space Operations Center, which was subsequently incorporated as ComSpOC Corp. ComSpOC Corp. is an AGI affiliate. ComSpOC fuses satellite-tracking measurements from a geographically diverse set of optical, radio frequency (RF), radar and space-based sensors to generate HiDEph and other SSA data products. These results are available via subscription to the next-generation space catalog, SpaceBook™, which currently includes over 8,000 space objects, and 100% of all GEO objects.